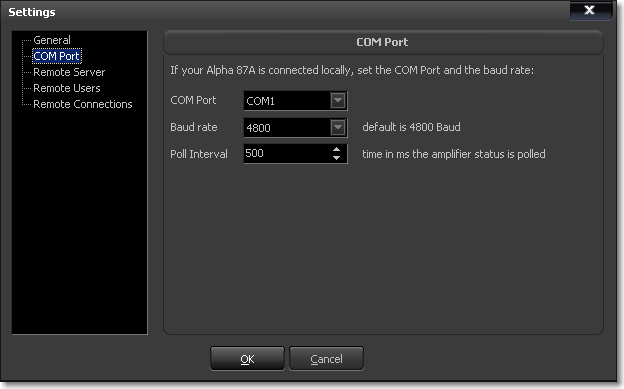 The first thing you do is to connect your Alpha 87A to a COM port on your computer using a RS232 cable. All available COM ports on your computer are listed in the COM Port drop-down. The Baud rate is 4800 by default but can be set to higher baud rates. Please refer to your Alpha 87A manual. The Alpha 87A command protocol offers a full set to completely control the amplifier - including switching it on and off. However the amplifier status has to be polled. This is done once every 500 milliseconds by default which is a good value for a baud rate of 4800. You can increase or decrease this Poll Interval.